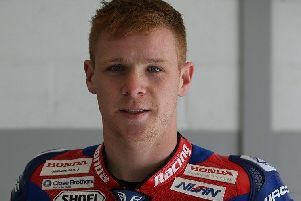 Market Rasen-based rider Jason O’Halloran opened his British Superbike campaign with two top-10 finishes at a rain-affected Donington Park over the Easter weekend. The Australian rode to seventh and ninth place at the Leicestershire circuit in round one of the 2018 Bennetts British Superbike Championship. Following a weather warning of heavy rain for Monday, qualifying was brought forward to Saturday where O’Halloran secured a second-row start to the first race which was also brought forward a day. The race was cut to 18 laps, and as the lights went out, O’Halloran moved into fourth place. But his progress was short-lived and he was relegated back to eighth on lap four. He began a comeback and picked off the riders ahead until he made it back into fourth on lap 14, and then began a monumental battle with his Honda Racing team-mate Dan Linfoot. The pair exchanged places throughout the remainder of the race, but on the final lap he began to encounter problems with the quick shift and lost ground to be overtaken by Glenn Irwin and Luke Mossey and cross the finish line in seventh. More heavy rain overnight caused flooding on the track in places and after lots of hard work by the groundstaff and marshals, the race was able to be staged. With the track drying fast it was a gamble on tyre choice and the majority went for full slicks, hoping to avoid the wet patches at Craner Curves. Once again starting from the second row O’Halloran was seventh on the first lap and became embroiled in a battle with James Ellison. Ellison got the better of him, he then crashed out of the race in the latter stages, leaving the O’Show to battle with Chris Iddon and Luke Mossey. They both overtook him with two laps remaining, and he finally crossed the finish line in ninth position to pick up seven championship points. This gave him a weekend total of 16 and left him in seventh place in the overall rider standings. The next round is at Brands Hatch on the short and technical Indy circuit on Sunday, April 15.